Grand Theft Auto's famous Cluckin' Bell chain of restaurants have a mainstay menu item called the Fowl Burger. 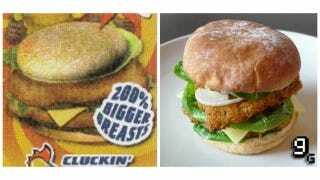 Looking like a filthy chicken burger, costing only $1 and regenerating health makes them magical. So magical it's worth trying to prepare your own, in the real world. Website Gourmet Gaming, who we've featured before, have the recipe you need, based as close as they could get to in-game images of the burger you can spot in Grand Theft Auto IV. Though, I must say, GG's looks much heathier.